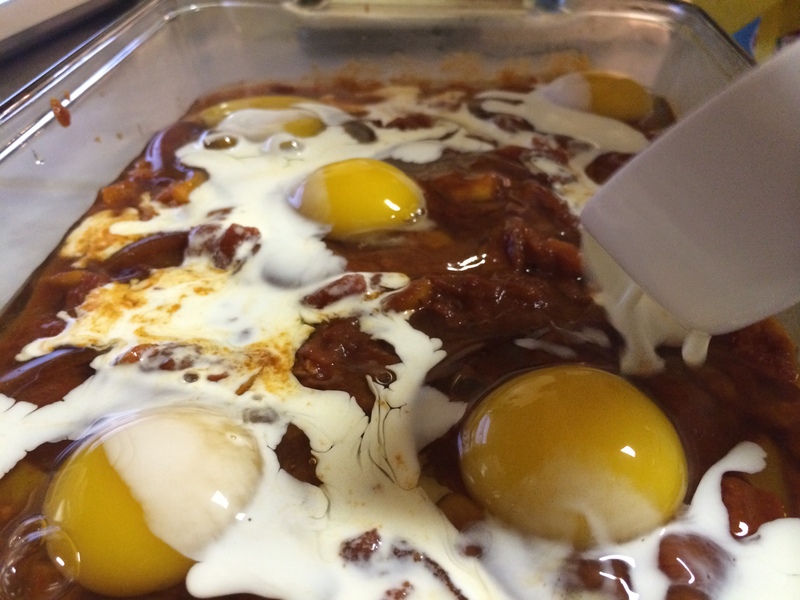 Shakshuka – Tunisian eggs baked in tomatoes – seems to be a divisive dish. Either you love it or hate it. It’s like the Hillary Clinton of recipes and everyone’s got an opinion. I, for the record, LOVED this recipe. And also Hillary Clinton. But mostly, this recipe, because it was spicy, kinda weird, and the easiest thing in all the land to make. Le Fiance…not so much. Though, much like his political beliefs, he’s a middle of the road man. Didn’t love it, but definitely didn’t hate it. Went searching for a third party candidate, which he found – in the form of ice-cream. Normally, I too, would rather eat ice-cream than a North African dish. Not because I believe in the less-ness of North African food, mind you. I just don’t like it. Tunisian, Ethiopian, Eritrean and other North African cuisines are often known for the addition of egg where, to my American palate, egg does not belong. I am also weird about eggs. There! I said it. What I’ve realized, however, is that a lot of people (Americans) think of AFRICA! as this magical place that still looks like The Jungle Cruise in Disney Land, and that everyone must be eating the same thing, the whole continent over, and that thing must taste weird and they probably won’t like it. If you have ever tried Ethiopian food and didn’t like it, you would probably think that, too, and then cease eating food from any part of Africa. I knew someone like that for a long time. Her name rhymed with Schmilary. But then I went to Africa and had to eat. For quite awhile. And in East Africa, I had some of the most wonderful food experiences of my life. In Tanzania, it was all mchele na maharage (rice and beans) all the time. Unless you decided to treat yourself by ordering chipsi mayai (fried eggs over french fries) and that, my friends, was always a very happy day. Simple foods that sustain. Plus, french fries. How can you not? To contrast: France. Center of the gastro republique. I was recently in Saint-Louis and ordered a martini rouge, thinking it would be some delicious berry-flavored martini. What I received was a glass of vermouth that tasted astonishingly of mushrooms. It was awful, and an awful food experience was something I thought impossible in tres chic France. The other awful thing? My grasp of the French language. Note to self: stick with wine. All of this is to say, both travel and cooking are so interesting because of the beautiful cultural collisions that happen most often around a table. We can learn so much about another country, its history and its people, simply by eating its food. And then you can decide if you like it or not. Because – NEWS FLASH – it’s okay not to like stuff. In the same way that my Czech friend thinks our American propensity for smoothies is disgusting (“You smooth everything! Spinach is smoothie! How ick!” – direct quote from Czech friend), I think drinking a full glass of mushroom vermouth is tres ick, or mixing eggs into things where eggs should not be mixed is ick. Until, that is, I made shakshuka. 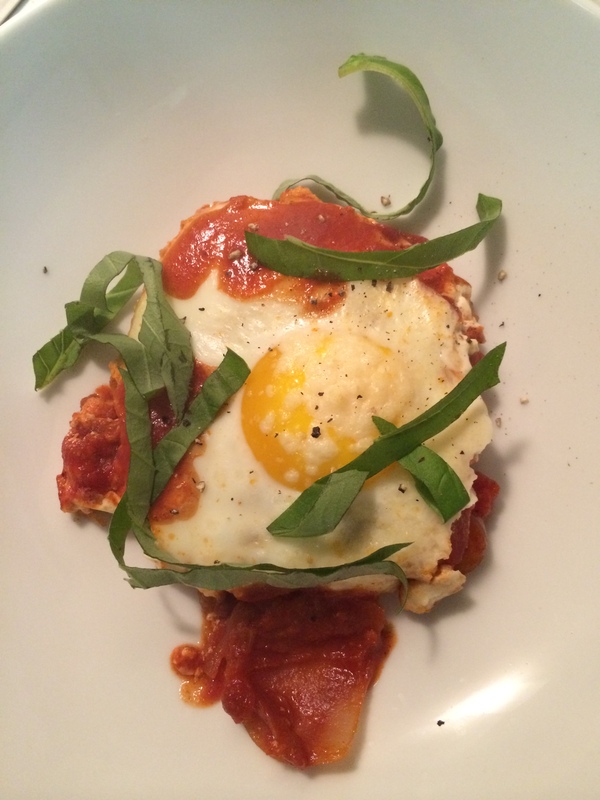 Picture this: fried eggs with delicious runny yolks. Fiery tomato sauce with a hint of smoke and a hefty kapow! of spice. Cheese. Oh! And more cheese. And fresh basil on top, but let’s be honest – the basil is the pretty-maker, the greenery that adds contrast in food photos. The basil is wholly unnecessary, as far as I’m concerned, because hi. CHEESE. Though it maketh my stomach hurt, it amazeth me, cheese. We ate it for dinner, but in my heart of hearts, I believe this to be a breakfast dish because that’s where eggs belong. Also, I’d LOVE to pair this with a large cup of coffee. And if all else fails…there’s always ice-cream. 1. Preheat the oven to 425. 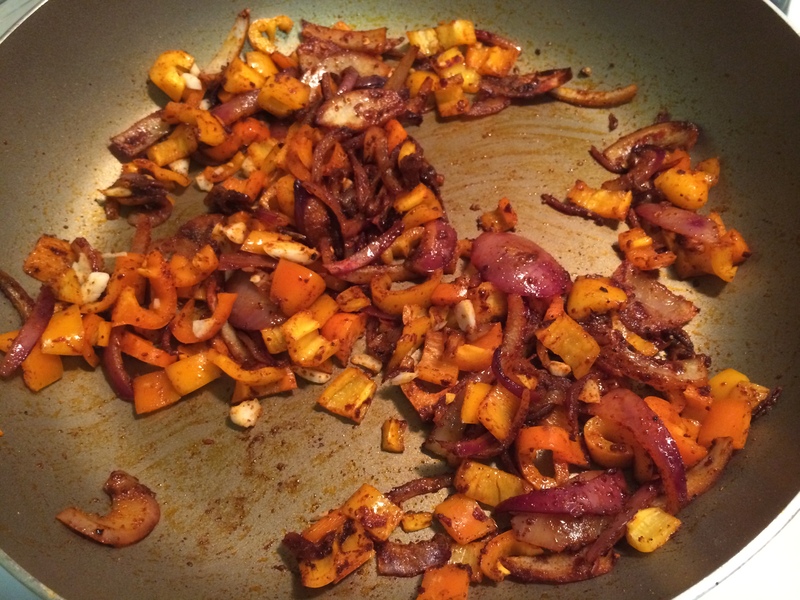 Then, heat EVOO in a large skillet and add onions. Cook them until they’re lovely and translucent. If you have a large cast iron skillet, you can do everything in it! Lucky you! If you are not so lucky as to be in possession of a large cast iron skillet YET (come on wedding registry!) then you will have to do some transferring. 2. Press in four garlic cloves, stir, then add paprika, cumin, pepper flakes and a pinch of salt. Cook on medium for another two-ish minutes. 3. Once things are mixed and fragrant and the bell pepper has softened up, add the wine and cook down until the liquid is reduced. This should take another two minutes or so. 4. Add tomatoes and increase the heat until your dish begins to boil. Not a rolling boil exactly (one of cooking’s most disgusting phrases) but a gentle boil, just up-tempo of a simmer, if you will. Do this simmering for about eight minutes, so things can absorb. 5. If you don’t have a cast iron, transfer the whole mixture into a glass baking dish (or small dutch oven) If you have a cast iron skillet, please forget we ever had this talk and proceed directly to number 6. 6. 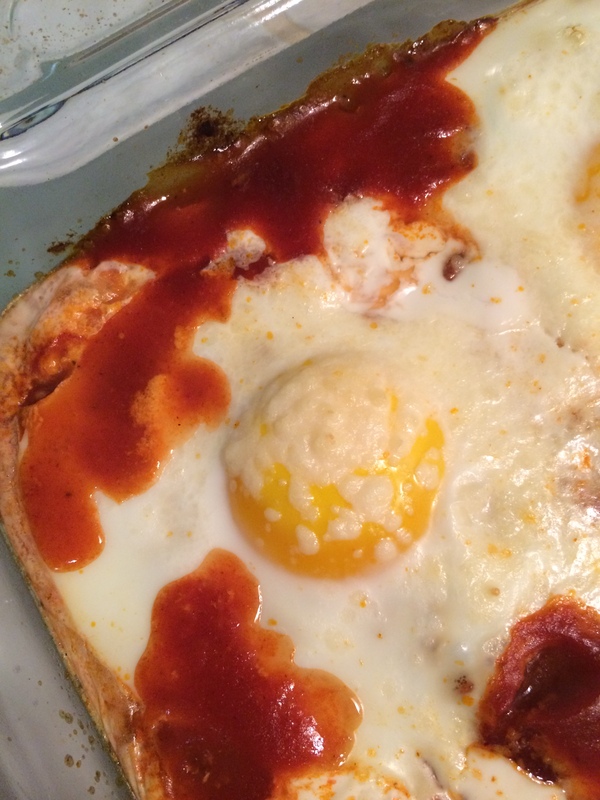 Turn off the heat and crack your six eggs directly on top of the sauce. It looks weird and a little gross, but you can do it. Then, crumble a little goat cheese over the top of the eggs (again, strange, I know) and then pour the half and half on top of THAT. You can use as much goat cheese as you like. We, the lactose-intolerant, treat goat cheese with a light hand, but you do you. Trust me, whatever you do, just put that sucker in the oven because it starts to look really gross. See? 7. Bake for 15-18 minutes, until the eggs set. If you don’t like your eggs too “eggy” (meaning runny, I guess?) then let them go for a bit longer. If you like ’em running like they’re in a half marathon, take them out at 15 on the dot. 8. Chiffonade some basil and top with parm or more goat cheese. We ate ours with hearty slices of this bread, as you probably could have imagined. Our menu a few weeks ago was a real winner, if I do say so myself. It’s helpful to plan your menus around something, to save on ingredients and to make sure you don’t waste anything. This week, I realized that I’d pinned quite a few recipes that called for tomatoes and basil, so it made sense to group them together this week and buy a lot of both. Once we got to Berkeley Bowl and saw the heirloom tomatoes, it was really easy to execute on this bad boy. Also, any week that involves a lot of tomatoes and basil is a good week. Add dark chocolate + wine and that’s pretty much all you need to eat ever again. You heard it here first! The other tip from this week is to make at least one dish that will freeze well. This particular week, it was the enchiladas. Le fiancé is an excellent cook, but it’s hard to cook for one. With two big work trips coming up, he’ll be kitchen solo, so I love to leave things in the freezer for him. I also love that that means he’ll do stuff for me later, like back rubs, laundry and putting up with me when I wear the same hoodie and dirty yoga pants for two straight days and walk around our apartment muttering about “the caterers, THE CATERERS!” He’s a gem. A gem deserving of many enchiladas.